Listen to the Princh Library Lounge to discover insights into creating the library of the future through discussions with influential library professionals from all over the world. Our guests will discuss and share their expertise on relevant topics for the global library community, such as library trends, challenges, and best practices. 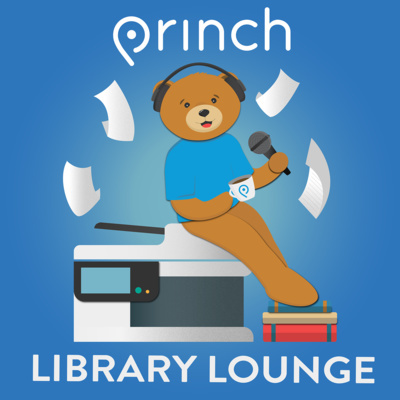 In episode two of the Princh Library Lounge our host, Vicky Woolbarn, talks with Beth Crist and Meg DePriest, about if library fines should be abolished. Beth is a youth and family services librarian at Colorado State Library, and Meg is a library consultant at California State Library. Check out the episode to hear all their insights! In our first episode of the Princh Library Lounge, our host Vicky Woolbarn talks with Jane Cowell (CEO at Yarra Plenty Regional Library in Australia) and Nick Poole (CEO at CILIP UK) about library neutrality and how it plays a part in the day to day of libraries. Check out this episode to hear all the great insights they shared with us! Meet Vicky Woolbarn, the host of the Princh Library Lounge podcast. Vicky is a library enthusiast, avid book reader and a Library Innovation Specialist at Princh. She is extremely excited to be hosting a podcast that will be informative for all who are passionate about the world of libraries. Check out our podcast trailer and subscribe on your preferred channel.